# Pie charts can be a memorable way of representing information. 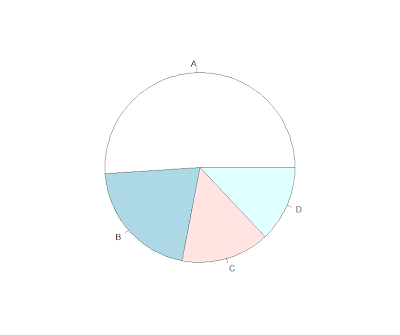 # There are a number of online examples showing how to create pie charts in R.
# Imagine you have survey response data from 100 respondents and your survey answers range from A do D.
# You would like to now see the pie chart of results you can simply tabulate. # We can see that about half the results are A followed by B then C then D.
# Note, that without including percentages it is often difficult to identify the differences in the individual sizes of each slice.